I’ve been really contemplating how to honor God this Lent season (yes, I know it’s supposed to be Lenten but that word just makes me think of lentils and that word just gives me the willies). And so I decided to give up Facebook for the 40 Days (although I “lent” on Sundays too cause I don’t do so hot on days “off” of things). But that seemed so… well, so not enough this year. Not only did I want to sacrifice something but I also wanted to offer up something. 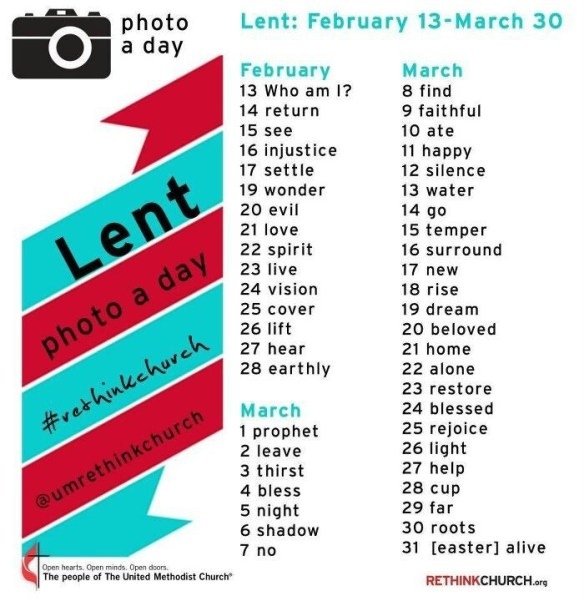 (Especially after reading mignonpanache’s post about Lent when she mentioned the idea of “mirroring” Christ for these forty days. I mean- in His Life, of course he sacrificed so much but He also GAVE so much and He continually pointed our attention to GOD. And I want to mirror that! How ironic that my sacrifice (Facebook) would be so similar to the thing I “offer” to Him… cause it’s on Twitter. Ha! And then I remembered just who I am IN CHRIST. And it was a refreshing reminder. sins. imperfections. goofiness. burdens. filth. exhaustion. happiness. reality. All of it is the real me. And the real me… is a saved me. And at the end of the day, that is what matters. That is what His Walk To The Cross was all about. Being public about the covenant has been one of the best things for me. Time and time again I have the motivation to make the right choices, the God-honoring choices, because I know that I have people that care about me reading. But the other day I realized another important truth about this covenant. Because I “went public”, this covenant is no longer just… my… covenant. I chose to share it with hundreds of people… originally in an effort to make myself accountable to others. And that is still a big motivation. But it has also become a help to people. I guess it’s encouraging for people to see someone else struggling with the same issues… to know that we are not alone. Like, on Facebook when another mom posts a pic of her kids and in the background I can see toys littered all around, dishes piled up in the kitchen, and a laundry basket overflowing with clothes to be folded… well, I just feel so much better! Oh, it’s not just me. It’s not just my house. It’s not just my family. my mistakes. my craziness. my mess. my life. I’m not alone! And I think that my covenant offers that to some people… a look inside a part of my soul that we spend such emotional effort trying to conceal. That part that we are ashamed of. But I do my best to take a look at my soul every day and take a snapshot of what it really looks like. Some days it’s nice and clean. Some days it’s just a little mess. Some days… it’s a total absolute wreck. 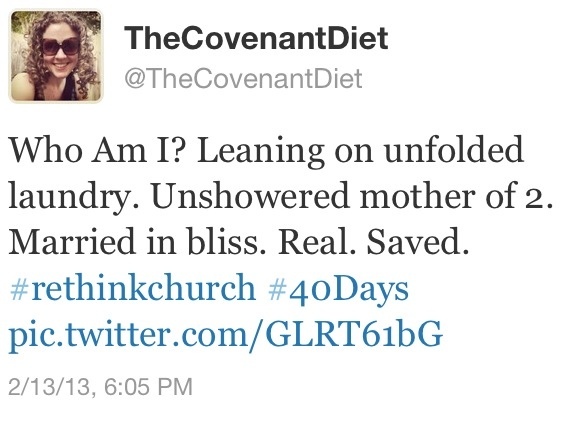 And that’s yet another part of this covenant that makes it so much more than just a “diet”. The connection that I have made with so many of you can’t just end on January 1st. And the connection that I have made with God can’t just end on January 1st either. And it made me realize… I have been entrusted with this gift of freedom and with the knowledge of how to get that freedom from food. I thought that a year would originally be my only “requirement” but now I see that I can’t stop this covenant. I can’t just go back to normal again eating ribeyes, and ice cream, and cookie dough, and a dozen breadsticks, and, and, and. I can’t just gain weight back when I’m off of this… it’s not just “some diet”… it’s a covenant with God that I have had. A Change of life… of soul… of heart. I can’t just go back. And, honestly, I don’t want to. One of the things that I have to watch out for whenever I start to get closer to Jesus: self-righteousness. Which is totally backwards because he was quite the opposite of self-righteous. He attributed everything to God. But, nonetheless, I start to think of myself as better than others. And I am brought down a bit today as I remember that it was only like two months ago that I was buried. drowning. suffocating. in my own addiction and vice. An addiction that I wanted to be rid of, but couldn’t shake it off. Ya know… I’m gonna stop myself right there. I say that my overeating never affected anyone and then I list three people that I know were affected by it. See?!?!?! This is an example of what I’m talking about. I have this self-righteousness that isn’t even deserved! And that’s the thing… I have no right to stand here (even if I am all by myself) and look down on anyone, but especially on someone that is struggling. Whether they know the are struggling or not. Whether they want to be struggling or not. Whether they know how to be free or not. My freedom was… a gift. A gift from God. And so what should my mind do instead? Instead, I want to pray that God gives them that gift as well. I want… desperately want… for my dear friend to be free of that vice, that stronghold, that addiction. And so I pray that God may break the chains and gift my friend with that freedom. For, I know… I have learned… that there is no other way to freedom than through a gift from God. But my judgment will not get her or any of my other friends closer to freedom. But perhaps my prayers… will get her closer. Today is not a post about eating or not eating. Today is not a post about my struggles and my successes. 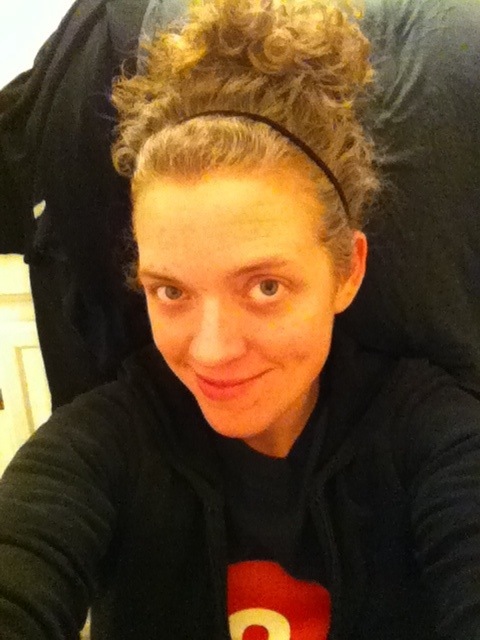 Today is not a post about… today, or yesterday, or the day before. Today is a post about tomorrow… or the next day… or next week… next month… next year. Dang. There are just some verses that don’t really need to be expounded upon… and that is one of them. So, some day down the road when life is just… icky… I will have those verses to remember. So, I know that I didn’t really say anything new… but today was just one of those days where I really didn’t think that I was supposed to say anything. Today, I let God do a “guest post” on my blog. Haha!